The End Of Rap Beef: "Jay-Z Is Somewhere Eating A Fondue Plate"
Omnipresent Sports Fan Drake was on the TSN broadcast of this afternoon's Nets-Raptors games, which the Nets won 94-87. 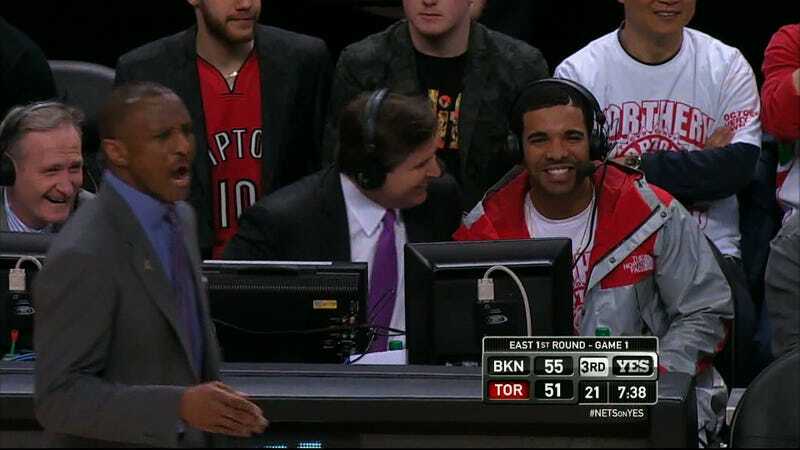 Since Brooklyn was in the house, Drake decided to take a few shots at the former owner of a tiny piece of the Nets and accused him of eating fondue. The era of the rap diss track is officially over. "It's like Hov can't drop bars these days without at least four art references," Drake says in the article, as found on DDotOmen. "I would love to collect [art] at some point, but I think the whole Rap/art world thing is getting kind of corny." Jay-Z then responded in a rap verse and now here we are: Drake talking about Jay-Z eating fondue during a basketball game. For real. You can watch the actual video here, which is not embeddable.